The self-described “law and order President” intends to pardon Paul Manafort for tax evasion and bank fraud he was still committing when he was Trump’s campaign manager. Wasn’t Donald Trump the one who was going to clean up the Washington corrupt swamp? Insiders in the White House are reporting that the President is still adamant about possibly pardoning Paul Manafort and that he’s now mulling over replacing White House Counsel, Don McGahn because he is strongly opposed to the idea of any pardon. According to Vanity Fair, two people familiar with the matter say Trump has been feuding with Don McGahn over drafting a pardon for Manafort on a laundry list of fraud charges last week and now faces a much more serious trial in Washington DC. McGahn — who has been cooperating extensively with special counsel Robert Mueller’s investigators with over 30 hours of interviews and exhaustive document production — is completely against the idea of pardoning Manafort. Trump, however, is terrified that his friend, whom he has known since Roger Stone and Paul Manafort set up their lobbying firm in the early 1980’s, is going to “flip” and turn over incriminating evidence to Robert Mueller’s legal team. The danger here, of course, is President Trump wants to pardon a man that committed tax fraud on $60 million of foreign income, deposited and hidden in dozens of foreign bank accounts at a time that our country continued to fight its longest war. It’s the kind of message that tells Americans that if you’re rich and have powerful friends “you are above the law,” say critics of President Trump. 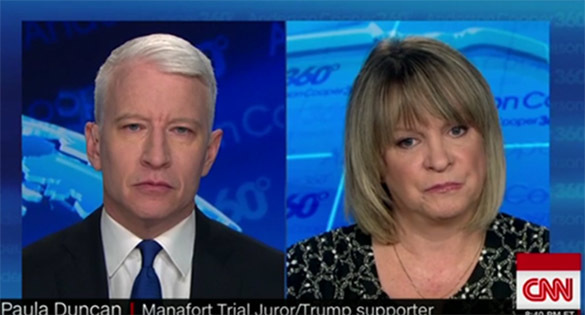 Paula Duncan, the Trump supporting juror from the Paul Manafort trial, says she believes it would be a "grave mistake" if President Donald Trump were to pardon his former campaign chairman. The “law is the law” … “justice was done” … “the evidence was there.” She then went on to say that it’s an “irony” that President Trump promised to drain the swamp in Washington and Manafort may be a prime example of that swamp.